How can you go wrong with a tasty cross between a cheesecake and a sponge cake? 1. Pre-heat the oven to 180C/350F/gas mask 4. Line a 20 cm (8 inch) round cake tin with non-stick baking parchment. 2. Start by making the sponge: take a small bowl and mix the ground almonds and gluten-free flour in it. Set the bowl aside. 3. Take a large bowl and grate the zest of 2 lemons into it. 4. Add the eggs and xylitol into the large bowl and whisk them with an electric whisk until their volume trebles. 5. Carefully fold in the flour mixture from the small bowl. 6. Pour the batter into the cake tin and bake in the oven for 30-40 minutes or until the top looks golden and a skewer inserted in the middle comes out clean. Let the cake cool in the tin. 7. While the cake is baking in the oven, prepare the cheesecake filling: take a bowl and grate the zest of 2 lemons into it. 8. Add the cream and whip until it has thickened but is still sloppy. 9. Take another bowl and mix the cream cheese and Sweet Freedom in it. Then stir in the sloppy whipped cream and combine thoroughly. Put the bowl into a refrigerator for the time being. 10. Now make the lemon sauce: squeeze the juice of all the lemons you have already zested into a saucepan. 11. Add the corn flour/starch and Sweet Freedom into the pan and mix thoroughly. 12. Bring the sauce to the boil over a gentle heat. Stir all the time. When the sauces starts to thicken, continue heating on a low heat for another minute, stirring constantly. Then set the saucepan aside and let the sauce cool to room temperature. 13. When the cake and the lemon sauce have cooled, it’s time to assemble the cake: cut the cake horizontally into half. Put the bottom layer on a serving plate. 14. 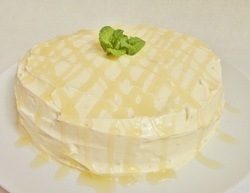 Spread ⅓ - ½ of the lemon sauce over the bottom half of the cake. Then spread ⅓ of the cheesecake mix on top. 15. Place the other half of the cake on top. Cover the whole cake with the rest of the cheesecake mixture. Use a spoon or a palette knife to spread the topping. 16. Put the rest of the lemon sauce into a piping bag. If you don’t have a piping bag, you can use a plastic food bag instead: just put the sauce into the bag, squeeze it into one of the corners and cut the corner with a pair of scissors (it’s best to make a very small cut to start with). Pipe the sauce over the cake. If you have any leftover sauce, you can serve it on the side. This recipe is from the book No Naughties: Sweet treats without sugar, wheat, gluten and yeast. 1. Pre-heat the oven to 180C/350F/gas mark 4. Line a baking tray with non-stick baking paper. 2. Mix the polenta (corn meal), flour, baking powder and salt in a bowl. 3. In another bowl, whisk the egg and xylitol with an electric whisk until the volume triples. 4. Mix in the vanilla. Fold in the flour mixture, the almonds and the chocolate drops. 5. Spoon the thick mixture onto the baking tray, forming an oblong that looks like a log. The size should be about 25 cm x 5 cm (10 inch x 2 inch). 6. Bake for 20-25 minutes until the log is pale brown. Take out of the oven and let it cool for 10 minutes. 7. Reduce the oven temperature to 160C/ 325F/gas mark 3. 8. Cut the oblong into 1 cm (⅓ inch) slices and turn them on their side. Bake for 10 minutes. 9. Turn the slices to the other side and bake for another 5 minutes. 10. Let the biscotti cool and harden on a wire rack for a couple of hours. If you want them really crispy, leave to stand overnight before serving them or storing them in an airtight container. If you can’t eat nuts, leave out the almonds. Copyright © Tarja Moles 2012. Photograph © Tarja Moles 2012. All rights reserved.